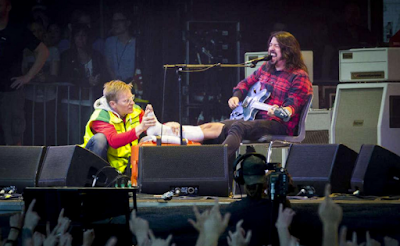 Dave Grohl broke his leg after falling off stage during a Foo Fighters show in Gothenburg, Sweden on Friday. Reports indicate Grohl injured himself during the band’s second song, “Monkey Wrench”, bringing the concert at Ullevi Stadium to a standstill. Grohl then called for drummer Taylor Hawkins to take over and lead the group through a set of covers, as he does with his side project Chevy Metal. “But right now,” Grohl said to Hawkins, “You gotta do Chevy Metal right now, you gotta do it. “Right now, I'm gonna go to the hospital, I'm gonna fix my leg, but then I'm gonna come back, and we're gonna play for you again. I'm so sorry." Hawkins and the Foos performed a series of covers before Grohl returned to the stage less than an hour later to finish the concert sitting in a chair at center stage with his leg in a cast. The Foo Fighters next appearance is scheduled for Sunday at the Pinkpop Festival in the Netherlands as they play dates on a European tour in support of "Sonic Highways."